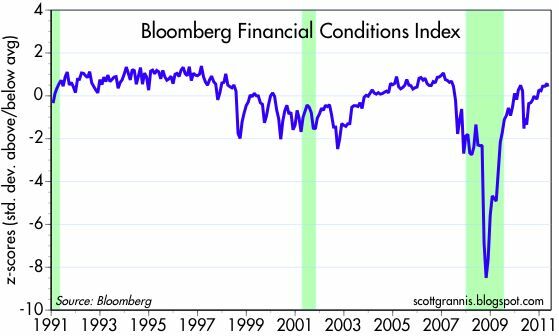 A reminder that financial conditions are looking pretty healthy these days (the more the index is above zero the better), and that is always supportive of growth. Index components: TED spread, CP/Bill spread, Libor/OIS spread, investment grade corporate bond spread, muni spreads, swap spreads, high-yield spreads, agency spreads, equity prices, and the VIX index. It's also a reminder of how far we've come in the past two years. I think the index is quite valuable as an early warning indicator. I would note that the index fell significantly more than one year prior to the financial crisis. It then began rising significantly well before the end of the recession. Indeed, it would be hard to find a better leading indicator than this one. What it is saying now is that it is highly unlikely that we are approaching any major type of crisis or recession. I think we are in the first inning of a secular global bull market. Mr. Grannis, thank you for pointing out that this Index is a useful "leading indicator". I hadn't followed it before. Your Blogs are truly informative! Thanks a bunch. Scott sure does nice work.